Stranger Things is a certified phenomenon now, but back when we reviewed the first season – before the Internet took a minor character to the Emmys and the show won five out of its eighteen nominations – the 80s’ nostalgia-fuelled drama was virtually unknown. That also meant there were no expectations from it, and it surprised everyone in the best of ways, with the younger characters endearing themselves to most if not all viewers. Unsurprisingly then, the show’s second season – titled Stranger Things 2, and out October 27 on Netflix – now has a lot to live up to. It’s been built up to a level of popularity enjoyed by the best, and Ross and Matt Duffer – the co-creators, writers, and directors on some of the episodes, who are professionally known as The Duffer Brothers – have to fire on all cylinders, and do more than just pay homage to the works it’s inspired by, including the likes of Stephen King and Steven Spielberg. The good news is that Stranger Things 2 is a better, more capable show in nearly every aspect from the get-go. In fact, the first episode of season two is one of the best hours of TV this year. It does the perfect job in introducing likely new villains and monsters, which includes the “shadow monster” you’ve probably seen in trailers, alongside new characters in the Hawkins School, two step-siblings one each in Mike (Finn Wolfhard) and Nancy’s (Natalia Dyer) respective age groups. The latter consist of Max (Sadie Sink), a tomboy who brings a new dynamic to the nerd gang, and a tinge of friction between the members; and her step-brother Billy (Dacre Montgomery), a jacked-up version of Steve’s (Joe Keery) jock side, whose perpetual anger hides something sinister. It also touches upon the fate of Barb (Shannon Purser), the character that took a life of its own post the first season last year, with her disappearance getting its own storyline. “Justice for Barb” has come full circle. Stranger Things season 2 is set in 1984, roughly a year after the events of season one, with the residents of small-town Hawkins, Indiana trying their best to return to normal. But through a combination of the residual effect of the Upside Down on Will (Noah Schnapp), who’s being treated differently by everyone, the continued activities of the Hawkins Lab, and narrative necessity – there’s no show if there’s no trouble – things are getting a lot stranger in Hawkins. As before, it’s down to Chief Jim Hopper (David Harbour) to investigate the new happenings, though there’s room this season for the hardened Joyce (Winona Ryder) too, whose previous experience has made her a more active agent. Also back are Nancy and Will’s older brother Jonathan (Charlie Heaton), as they push to expose the scientists and their doings, in a bid to help bring closure to Barb’s parents whose own pursuit for answers has driven them into debt. Interestingly, that means the AV Club gang of eighth graders aren’t always at the centre of the narrative, with season 2 of Stranger Things feeling more like an ensemble than ever before. Mike’s biggest fear in early episodes is the easy acceptance of Max by the other three, which likely stems from losing El (Millie Bobby Brown) in the finale last season. Though the character’s fate was initially a mystery, a new trailer has made it clear that she’ll have a big part in season two, though it’s much more on her own this time. Dustin (Gaten Matarazzo) and Lucas (Caleb McLaughlin), meanwhile, are both busy falling for Max, though their attempts at impressing her vary widely. It’s also the cause of big monster trouble later – Netflix has forbidden critics from talking it about in more detail – but more importantly, it stands out as a rare example of lazy writing on part of The Duffer Brothers, as Dustin’s actions seem very out-of-character. Lucas and Max’s interactions seem a lot more genuine, and the writers are also clever enough to make a self-aware dig. At one point, after hearing about the entire first season from Lucas, Max calls it a little derivative in parts, wishing it had more originality. It’s almost like the writers are knowingly commenting on their own efforts from the first season. That leaves Will, whose abduction by the Demogorgon in season one may have made him a central focus, but it essentially took him out of the action for long periods of time. Now back in the real world, but still reeling from its effects, Will is an active focus in Stranger Things 2, owing to the nightmares he has or the connection he shares with the monster. It makes for some fascinating scenes early on, and is also the cause of some deceptively, intriguing twists midway through the season. Helping the writing again is the show’s top-notch cast, which grabbed a SAG Award for Outstanding Performance by an Ensemble last year, and improves in season two owing to a better understanding of the parts they play. That’s especially true of Brown, whose expanded solo arc requires her to carry multiple scenes on her own, and which she handles with finesse. It also helps that Stranger Things season 2 is properly paced – the count of nine episodes is one more than last season – with the show never lagging or intentionally slowing down to make up time. And as always, it manages a healthy sprinkling of references to its 1984 period setting, be it The Terminator playing in theatres, the heavy use of Ghostbusters – from the costumes to the soundtrack – in the second episode, or linking Max’s arcade nickname to her being a “road warrior”, alluding to George Miller’s critically-acclaimed 1981 Mad Max sequel. Although the first season turned Stranger Things into a breakout hit, it wasn’t a great show, given its heavy reliance on remix culture and 80s nostalgia to hook viewers, from kids on bicycles, government conspiracies, and high school romances. As Max said, it was derivative. 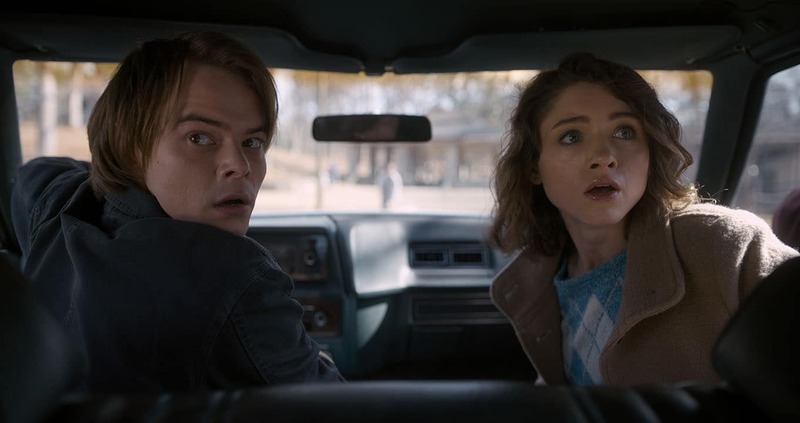 Of course, all of that is still here – there are multiple nods to the Cold War era, and why what happened in Hawkins needs to be kept quiet – but The Duffer Brothers have creatively expanded in season two. By allowing the kids gang to branch into their own sub-plots and inter-linking that to explore their evolving friendship, creating a bigger universe of monsters that provides action-packed thrills, and honing the art of the unexpected while knowing when to upend existing tropes, Stranger Things season 2 is a more refined version of itself in the new season. While the furore last year might have gotten a little out of hand, there’s no doubting its credentials now. Stranger Things season 2 will release October 27 on Netflix globally.